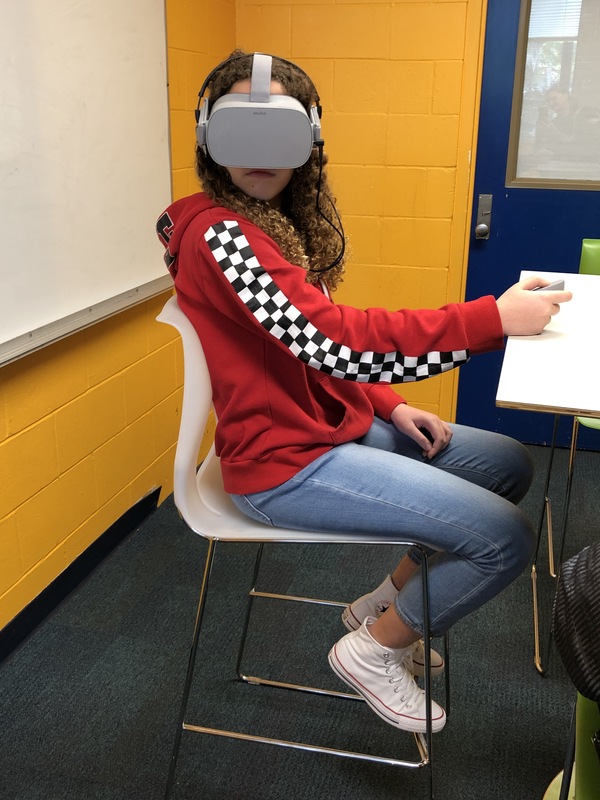 The Virtual Climate Scientist project is an immersive virtual reality experience designed to teach middle school students about paleoclimatology, developed as a result of a partnership between P.K. Yonge’s 7th Grade Science instructor Mayra Cordero, Ph.D. and College of Journalism doctoral student Daniel Pimentel. Funded by the Thompson Earth Systems Institute at the Museum of Natural History (https://www.floridamuseum.ufl.edu/earth-systems/), the project uses virtual reality headsets and controllers and students play the role of climate scientists carrying out research in Antarctica. The interactive experience allows students to visit a polar ice cap, use equipment to extract an ice core, inspect its geological markers for global climate change indicators, and learn how scientists use this information to make predictions of future climate change. The 10-minute simulation will be integrated into the 7th grade weather and climate science curriculum at P.K. Yonge Developmental Research School.